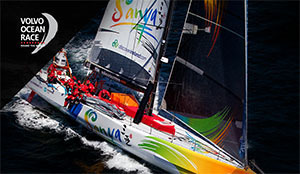 Home » CatDV has a vital library management role in television production for the Volvo Ocean Race. The event is held every four years. This year’s competition runs from November 2005 to June 2006 and is being televised around the world. To support the television requirements a brand new production facility was recently installed at the race headquarters at Fareham in the south of England. Square Box Systems Ltd were chosen to provide the library management software at the heart of the system, with a solution based on CatDV and the CatDV workgroup server, as well as some customised feature development. Together the three edit suites and library system comprise 6 PowerMacs (dual 2.7GHz G5), running Final Cut Pro Studio and connected via a fibre channel link to three Apple XServe RAID file servers. These run SANmp and give access to a total of more than 20 terabytes of shared storage. Various tape decks are used, including DVW500 DigiBeta player recorders, DSR-45 decks for DV format, and Sony J-30s, together with Blackmagic Decklink Extreme video cards, allowing capture and editing of uncompressed video; each edit suite is also equipped with Mackie audio controllers and Genlec speakers. 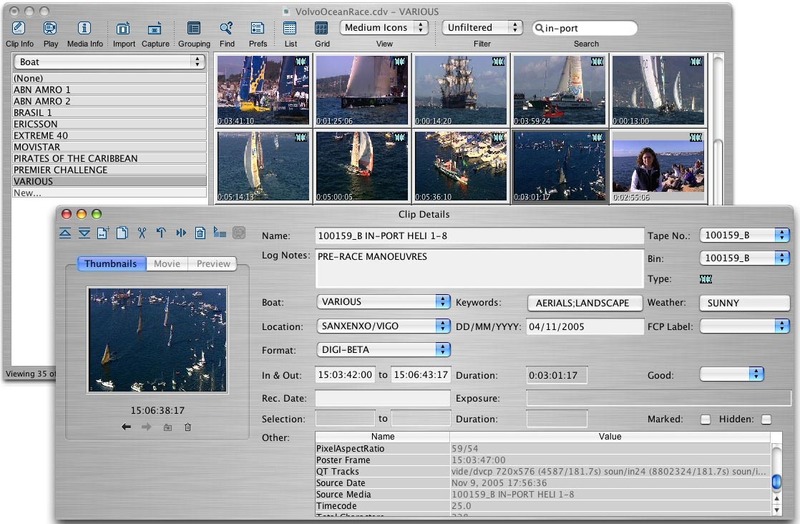 Footage comes in in a variety of formats, including MPEG-2 satellite feeds, Digibeta and DV tapes, and Windows Media feeds from the boats (the latter are converted to QuickTime files for editing using Flip4Mac Pro). Whatever its source, though, all the media needs to be logged and tracked consistently as it’s added to the library. When a new tape arrives the librarian or her assistant assigns it a barcode label and captures it straight to the SAN, using Final Cut Pro’s Capture Now command. The captured files are then imported into the CatDV library and logged using the CatDV client application. First, key information relating to the tape as a whole is entered – its reel number (read using a Bluetooth wireless barcode reader), the tape format, the date of shooting, which leg of the race it relates to, and so on. Then, clips on the tape itself are logged, to as much detail as required or as time allows. CatDV’s automatic scene detection may be used to produce a detailed log of each shot, or the operator can scrub through the file with a slider and split it into coarser sub clips (by splitting the master clip manually at particular points). Keywords and comments are added to these clips, either by selecting them from a drop down list (such as the boat name, or a description of prevailing weather conditions) or by entering free form text. As soon as they’ve been logged and published to the server, the clips instantly become available to all the edit suites. Producers can rapidly search the entire database to find matching clips, mark In and Out points or even create a rough cut sequence, then export a Final Cut Pro XML file and send it to one of the edit suites for finishing. The editor just loads the XML file into a Final Cut project then sees the selected clips, complete with original log notes, notes or subclips created by the producer – all with links to the original media on the SAN, at full quality and ready for editing. Everyone involved is constantly amazed at how quick and easy it is to find the material using CatDV. The whole process from typing in keywords to searching the metadata for hundreds of hours of material, to previewing the results, then sending them to Final Cut Pro and starting editing now takes just moments, whereas previously a production assistant might have spent half a day searching the tapes – and still missed that crucial shot! As well as the original captured media held on the SAN and available to the edit suites, lower res versions of the same media are made generally available on the LAN. Anyone in the building can search the CatDV database and play an MPEG-4 preview of the results from their office PC if they don’t currently have access to an edit suite (perfect if one of the producers wants to view a tape and do some basic offline editing from his desk, for example, or when selecting material to update the web site). Finally, the master tapes themselves need to be archived and looked after. These are safely stored in the library but often need to be lent out, perhaps somebody wants to take the tape away to work on, or it’s a new tape that hasn’t been digitized and logged to the server yet. A special tape management screen in CatDV records the shelf location and other important information about all the tapes. It also interfaces to a barcode reader, so doing a stock take of the library or checking in and out tapes is a simple matter. Volvo Ocean Race. Production on the project is handled by Sunset+Vine, while equipment and training were provided by Kevin Duggan and Quad Logic Systems.